Black Mesa's overhaul of Gordon Freeman's educational field trip is a lovingly crafted tribute to the FPS classic, but it's still not entirely done. Although the team is working on the concluding Xen areas, certain earlier parts took cuts to stay on schedule. A notable example is the Surface Tension chapter which abruptly cuts off after a one-man assault on the dam section. Luckily, one gamer took it upon himself to design and restore missing levels with the Surface Tension Uncut mod. Modder TextFAMGUY1's three levels cover Surface Tension's second half, including a tangle with a tank, flying alien manta ray things, and a lot more zappy noises. 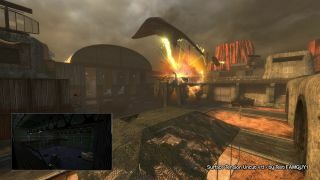 Like the majority of Black Mesa, the mod's level design incorporates new buildings and altered layouts while keeping the core pacing right on track with the 1998 original. It's unknown if the Black Mesa team will go back at some point and release official updates to the shortened levels, but TextFAMGUY1's effort is here now, so head to Mod DB to download it, and keep an eye out for more of TextFAMGUY1's work—he's planning a retouch of the On a Rail chapter next.